Danigirl posted this question on her blog yesterday, so I thought I would give it a whirl. Bear with me as there many things around my house that remind me to be blissful or that life is precious, so I will have to pick a few. First off is my mantel. It isn't really supposed to look like this it was temporary, but I haven't put up the little shelves that are supposed to house all these little trinkets so for now they sit on my mantel. It is my reminder of the beach, my happy place, my home away from home. Each of the little blocks of wood represent a store or restaurant in Rehoboth Beach. They are called "Cat's Meow" and they are supposed to sit ontop of doorframes. In our new homes here there are no door frames on the main level to hold the "Cat's Meow". The first time I bought one was the first year I took my husband to the beach, and we add on every year. Sometimes I buy two if they are little ones, and once in a while my Mom will bring one home for me. Anytime of the year I can look at my little beach and feel that I am in my happy place. 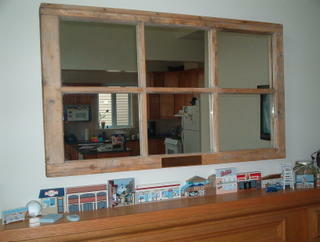 Above my mantel hangs a mirror made of an old barn window. My Uncle made this for my Husband and I as a wedding gift. It has so many special meanings that I will tear up just writing this. My Uncle never went to any family weddings (of all the cousins), he did not even attend his own kids weddings. Our wedding was the first one he was going to attend. We were getting married on his Birthday. He remembered that I said I loved the mirror he made for his daughter so he made us one and put a scripture on the bottom (Matthew 19:6). My Uncle went into the hospital the day before my wedding and passed away a few months later (from lukemia and other ailments he didn't know he had). Some days when life seems to be a bit rough I stand in front of the mirror and think of him, he always makes me smile. This crazy painting was done by our oldest. He was ten when he painted it. It was hanging on his mother's fridge and one day when my Husband was picking him up he said how much he liked it. That year for Father's day my Husband received it framed and wrapped up. It is special in so many ways, the only Father's day gift he has received from our oldest guy and the only time his mother actually helped him put one together. 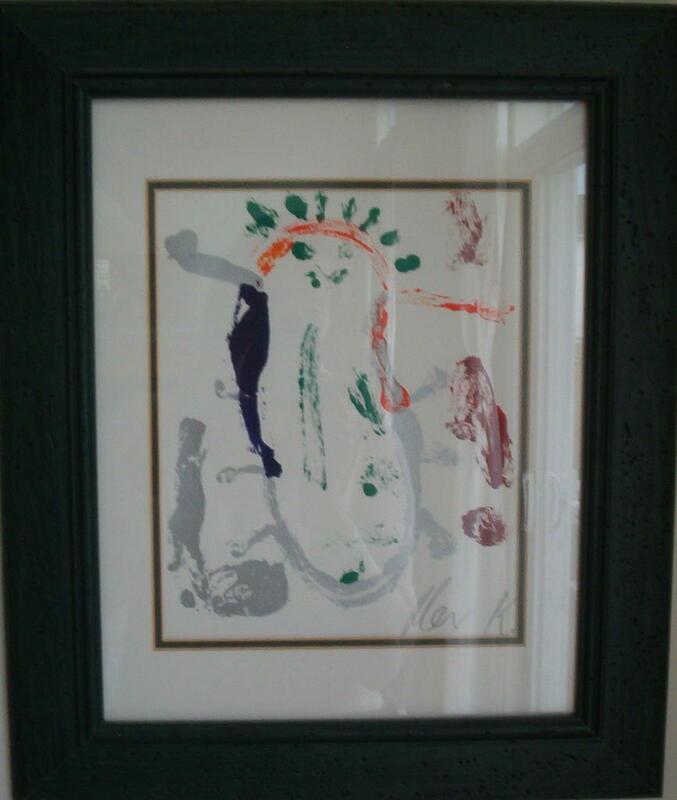 I know so many parents that have boxes and boxes of artwork from their kids. We only have a small folder from our oldest and all of it was done at our place. This is the only thing we have that he did at school. It is so wonky and crazy and I love it. I have so many more, but these few little tidbits are some of the brightest spots in my house, so I thought I would share them. I loved those things you posted in yours. And I have to agree that that Mirror is something special. I've always aadmired it when I have been over to you home. 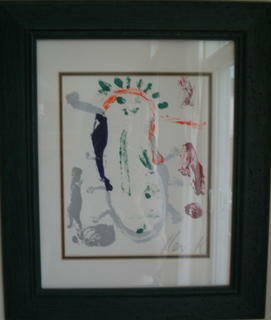 And Well I love any childs artwork as well. Always means alot! The history and meaning behind your mirror is beautiful. I am also rather partial to your favourite type of artwork, have a couple of those in my house too. I love these Anna!! 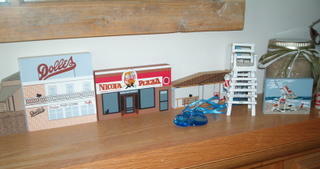 I think the little shops that go over the door are so adorable - I'd love to find something like that around here. And knowing your family story a little bit, I truly love the Father's Day picture... won't be long before you can make a second one and have a matched set from the two boys!